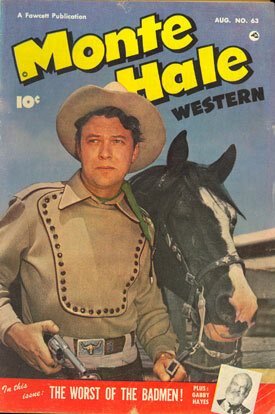 Monte Hale began his starring career at Republic in April ‘46 with “Home On the Range” in Trucolor. 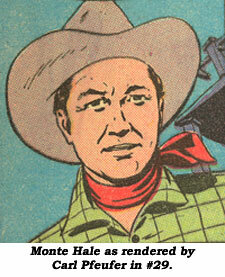 An obscure comic book from Lafayette Street Corp., PICTURE NEWS #8, adapted the film into comic form, but no other Hale stories were published until the popular Fawcett added Monte to their star-studded cowboy line-up in October ‘48 with MONTE HALE WESTERN #29, actually #1, the numbering picking up from the canceled MARY MARVEL. 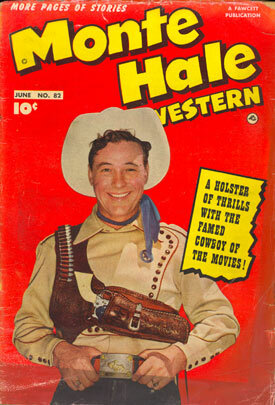 Fawcett published 54 Monte Hale comics through #82 in June ‘53, three years after Monte’s westerns had ended at Republic. When Charlton took over the defunct Fawcett line, they revived the title for a while from February ‘55 (#83) to January ‘56 (#88), but they were all reprints. All the Fawcett issues had gorgeous photo covers while the six from Charlton had crudely drawn covers with only a photo headshot of Monte in the corner of the cover. However, the Charlton issues did have movie-scene photo back covers. Initially, Carl Pfeufer, best known for his exciting work on Fawcett’s TOM MIX, drew Monte’s stories (above), with an inking assist from John Jordan. Pfeufer, born in Mexico City in 1910, immigrated to New York with his family around age seven. After attending art schools, he became a noted magazine illustrator in the early ‘30s. He next created the short-lived DON DIXON newspaper strip, did some pulp mag illustrations, then broke into comic books drawing SubMariner for MARVEL MYSTERY COMICS. Pfeufer became a workhorse at Fawcett in the late ‘40s and ‘50s, illustrating Tom Mix, Ken Maynard, Ibis the Invincible, Don Winslow of the Navy, some Gabby Hayes and many Monte Hale stories, among others. He retired to Texas where he did painting until his death in 1980. Pfeufer captured a good likeness of Monte, but the artist most closely associated with Hale as of #34 is Edmond Good who picturized Monte with a dynamic, forceful flair for action. Good, born in Canada in 1910, attended a Hamilton, Ontario, art school and became the creator of the Canadian hero Rex Baxter first seen in DIME COMICS #1 (2/42). Good left Canada in ‘44 to draw SCORCHY SMITH for newspapers until ‘46. He later worked on CASEY RUGGLES, RED RYDER and BRUCE GENTRY strips. He moved heavily into comic book work at several companies in the ‘40s. Good started his own company, Good Comics (distributed by Lev Gleason), in ‘55, but only a few poorly received comics materialized. He later dabbled as a TV script writer on “Dr. Christian” and a few others. Good’s work was seen in virtually every issue of MONTE HALE until the end of the run, although Pfeufer continued to contribute stories (with various inkers other than Jordan). Other artists who worked on MONTE HALE from time to time were Max Elkan, Al Bare, Gil Kane and Bob Laughlin, as well as a couple of unidentified artists. But Ed Good contributed about 75% of the Hale work. Gabby Hayes back-up stories began in MONTE HALE with #34 and ran through #80 with art often by Leonard Frank. Monte’s exciting stories riding his movie horse Pardner featured a series of recurring and unique villains—The Gravedigger, Minstrel Man, Wolfman and The Coyote. For the record, the later Charlton reprint issues are #83 (reprints #68), #84 (reprints #72), #85 (reprints #73), #86 (reprints #74), #87, 88 (reprint various Hale stories from REAL WESTERN HERO #72, 75, 76, 81, 85. 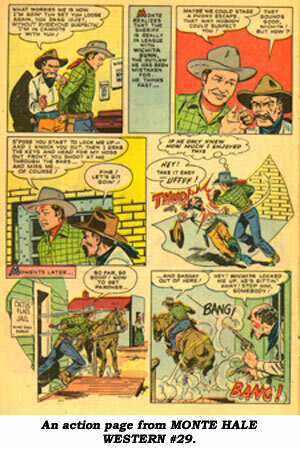 Fawcett’s anthology comic, REAL WESTERN HERO, began in September ‘48 with #70 (continuing the numbering from the canceled WOW). The title was shortened to WESTERN HERO with #76 and ran until #112 (3/52). Stories were of Hopalong Cassidy, Tom Mix, Gabby Hayes, Tex Ritter and Monte Hale. One Hale story was featured in every issue with Monte capturing the cover on #88, 91, 93, 95, 98, 100, 102, 104, 106, 107, 109, 110, 112. A variety of artists worked on Monte here with an excellent likeness in the stories done by Al Bare with inker Bob Butts. Fawcett’s other anthology comic, SIX GUN HEROES, featured Monte in #18 (1/53) thru #23, and #25 (3/54). Monte had the cover on #18 only. Other stories starred Lash LaRue, Rocky Lane, Tex Ritter and Hopalong Cassidy. 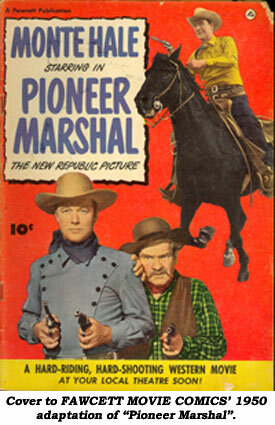 Still further, FAWCETT MOVIE COMICS adapted three Hale Republic B’s into comic form: “Pioneer Marshal” (‘50), “Old Frontier” (2/51) and “The Missourians” (4/51). 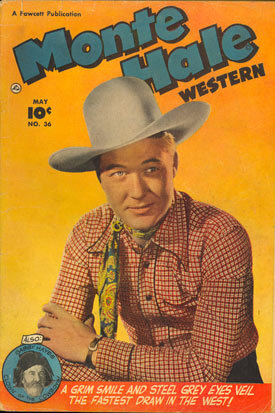 Fawcett’s MOTION PICTURE COMICS #101 likewise adapted “Vanishing Westerner” in ‘50. Unfortunately, the various artists’ renditions of Hale looked nothing like him, often closer resembling Rod Cameron. 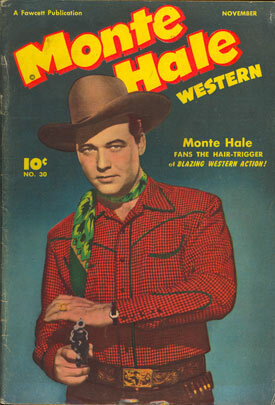 MONTE HALE WESTERN was quite popular in the ‘50s, and today #29 (#1) usually sells for $110 in Fine, #30-50 from $39-$49 in Fine, #51-82 around $30 in Fine. The Charlton reprints are overpriced in the COMIC BOOK PRICE GUIDE and should sell for $15-20 rather than the $30 Fine listed. 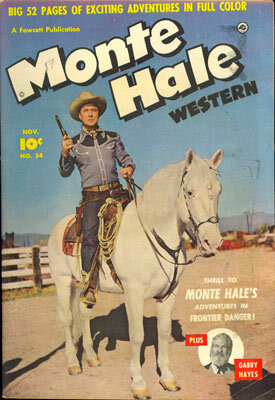 Note the white horse Monte is mounted on for the cover of #54. Reportedly, Monte was called in to do some comic cover photos one morning. The photo shoot was held at a stable where The Lone Ranger’s Silver was stabled and Monte ended up astride the masked man's mount. Silver is also on the covers of #68 and #81. 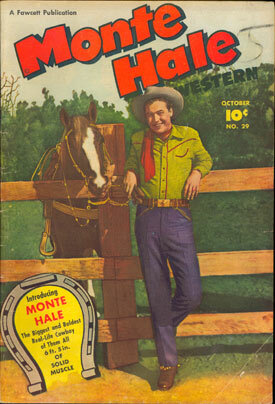 Monte Hale was asked by Gene Autry’s Flying-A Productions to star in the “Champion” TV series, but Monte, not wanting to take second billing to a horse, turned it down. The role was filled by Jim Bannon.